I've finally gotten around to swatching the new NYX Roll on Shimmer in Green that I received in my February MyGlam Bag. I'm not a big fan of this color but I think it could be fun to wear for St. Patrick's Day or if you like wearing bold statement colors. 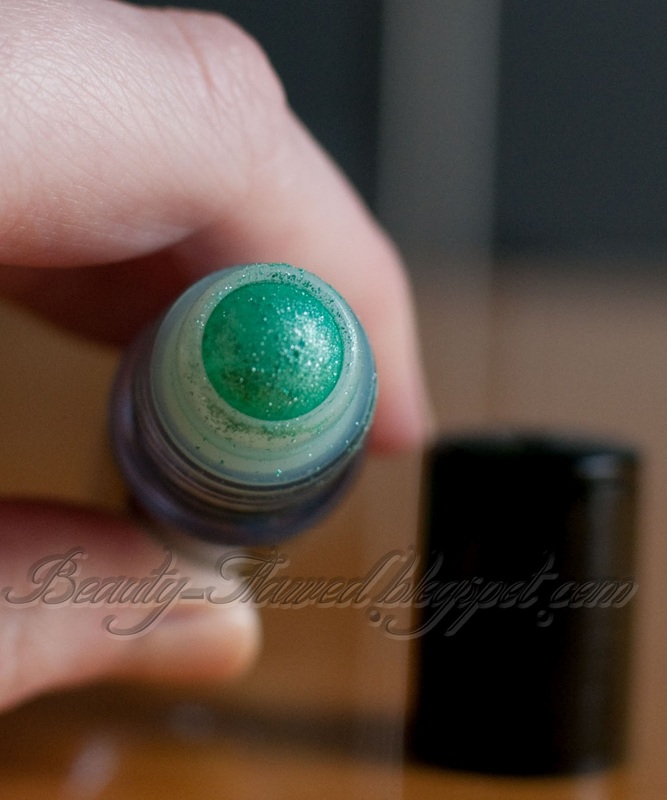 This Roll on Shimmer can be used on eyes, face, and body. I have seen some ladies putting it on their lips but I do not recommend this if you have the green or blue ones since they may contain Ferric Ferrocyanide or Chromium Oxide Green. These two ingredients are not safe to be ingested and if your putting it on your lips your bound to swallow some, mind you it would take a good amount to make you sick I just don't think its worth the risk. Looking at the label on my green bottle it only lists the basic ingredients and does not have any listing for the May Contain ones like the NYX website does. I'll put the full list of ingredients and may contains at the end of this post. Now onto the application which is very different from other products because it is a roller ball! Which was one of those "it was a good idea" at the time ideas. The roller ball makes the application of this product messy and awkward all at the same time. Now I attempted to use this applicator to apply it to my eyes for the sake of telling you guys how it went, it didn't go well. Talk about a giant mess with tons of fallout and uneven color application my entire face was covered in green specs that were a pain to get off. I find rolling this out on your hand and then applying with a brush is a much easier way to get even color and way less fallout. 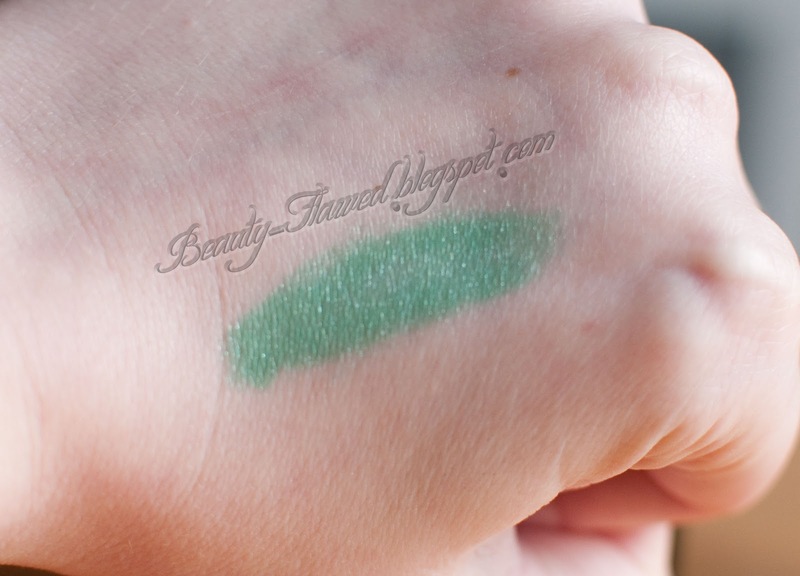 The color is very nice and has great pigmentation, this is the part that saved me from totally loathing this product. I think it has great potential but the roller ball does bring this product down in my opinion. In the left hand photo below I applied directly to my skin with the roller ball and as you can see there is a tons of left over product that didn't really stick. On the right I blew away the excess and that is the color you have left underneath. I did not use primer on these swatches. If you look as the last picuter you can see that there is a lot of excess getting left on the roller ball so essentially it wasting a bit of product as well. De potting this wouldn't be a bad idea if you can crack it open. These NYX Roll on Shimmers come in a variety of shades from neutrals to brighter tones I think had I received a different color I would have been all for this product but that's the beauty of being part of a sampling service you get to try things you wouldn't normally buy on your own. You can find these for $4.50 from NYX Cosmetics website or they can be found at store's like Ulta. 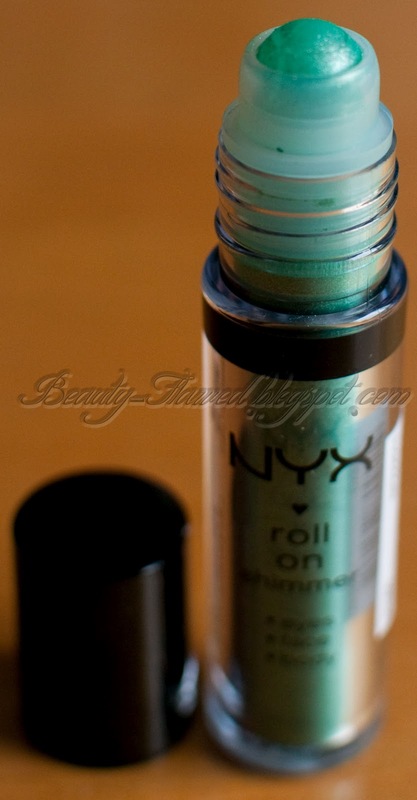 Have you tried any NYX Roll On Shimmers? INGREDIENTS: Ethylhexyl Palmitate, Dimethicone, Methylparaben, Propylparaben, Mica (CI 77019), Titanium Dioxide (CI 77891). MAY CONTAIN: FD&C Blue.1 Al. Lake (CI 42090:2), FD&C Yellow 5 Al. Lake (CI 19140:1), Iron Oxide Black (CI 77499), Iron Oxide Red (CI 77491), Iron Oxide Yellow (CI 77492), Ultramarine Blue (CI 77007), Manganese Violet (CI 77742), Ferric Ferrocyanide (CI 77510), Carmine Al Lake (CI 75470), Chromium Oxide Green (CI 77288). Great review. This looks so cool. I never seen these before. The color looks really pretty. that's a very pretty shimmer, and very pigmented too! I was pretty impressed with the pigment as well. I got the same color in my Glam Bag. I'm not a fan of the roller ball idea. It's too uneven and produces way too much fallout. I'm going to try to crack it open and depot it, but then again, I'm not really a fan of the green color. Pretty color, but not for me. Yeah I feel the exact same way about the color and application!! I have never used the NYX roller ball shadows before but I have used other brands. They did the same as this NYX one. :( The color is very pretty and your right, de potting would be great for this, maybe even pressing it into a pan. Yep I'm hoping to pull off some sort of look for St Patty's. 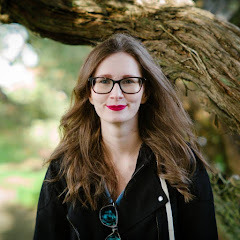 It is I suggest rolling a bit out onto your hand and applying with a brush. That is one gorgeous color. Like, really striking. 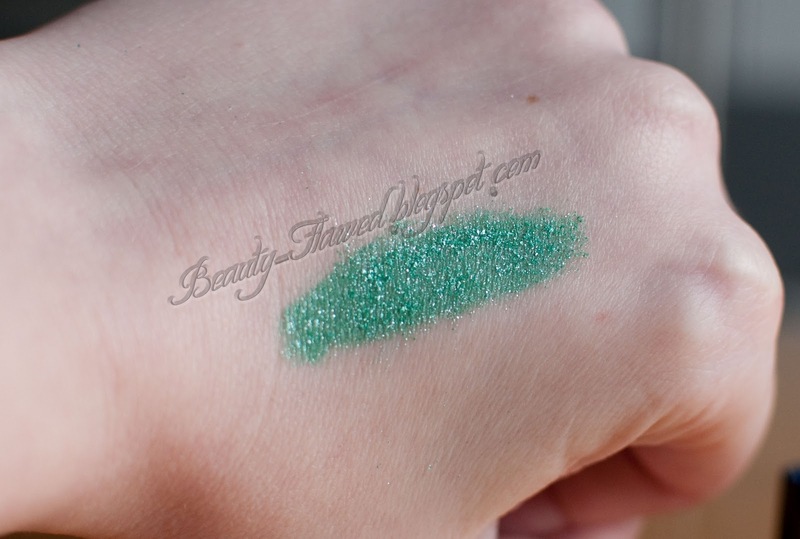 I've actually never tried this roll on shimmer...my adventurous side in cosmetics is basically non-existent. But I do like the idea and the shade is awesome, I love green! I am actually shocked at how pigmented those things are. When i think roll on anything, it immediately makes me think grammar school. New follower from Beautylish by the way!